It's a testament to car culture in general that an automaker believes it can build a theme park based on its brand and that people will come. Ferrari is one of the few names with enough draw to make such a venture work, and Abu Dhabi is perhaps the only place in the world with enough real estate and wealthy patrons to keep it running. Hence the Ferrari theme park, which we've spoken of at length in years past, has laid the first brick of construction on the 2,500-acre Yas Island it will call home. 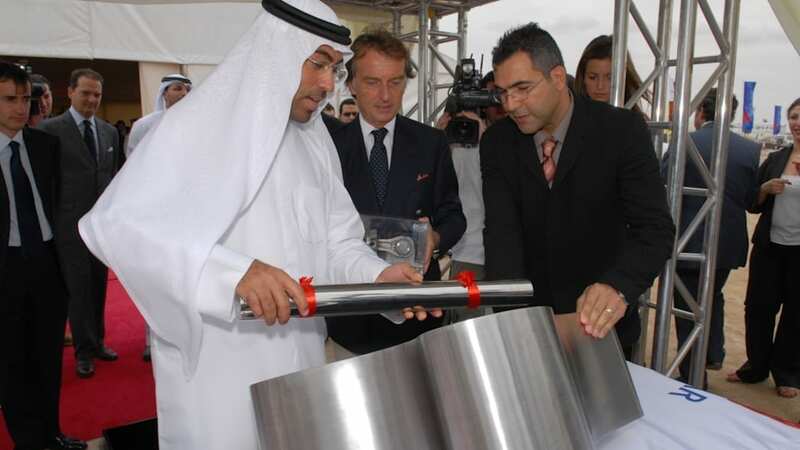 Yesterday a "Foundation Stone Ceremony" was held on the site where a time capsule was buried containing a connecting rod and piston from the 2007 F1 World Champion Ferrari car, as well as the first rendering of the theme park that was commissioned. For those who think Ferrari merely sold its brand to a construction company that will paint some old Disney rides Rossa Red, consider that Ferrari president Luca di Montezemolo was on hand at the ceremony yesterday to press the flesh with fellow investors. Aside from being a theme park with various sorts of Ferrari-themed entertainment to enjoy (we call front car on the Enzo Coaster! ), the facility will have its very own circuit built right in its center that will host driving schools, as well as the first Abu Dhabi F1 Grand Prix in 2009. Thanks for the tip, Marc! Yas Island - Abu Dhabi, November 3rd, 2007 – A Foundation Stone Ceremony was held today in Abu Dhabi to officially signify the start of construction of one of the most multi-dimensional and highly anticipated themed entertainment attractions in the world, the Ferrari Theme Park. Officials and special guests in attendance for today's event included Ferrari's President Luca di Montezemolo and Ahmed Ali Al Sayegh, Chairman, ALDAR Properties, as well as invited guests representing media, government and business organisations from around the world. 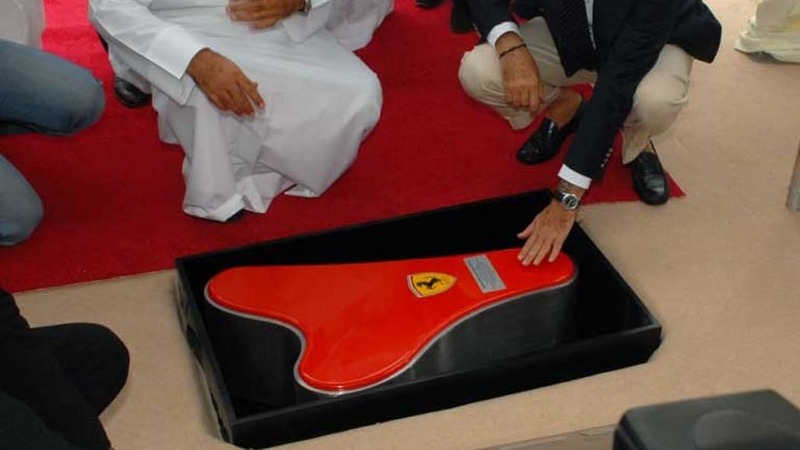 During the Foundation Stone Ceremony a special time capsule was buried, containing a Conrod and Piston of the F2007, the F1 World Champion Ferrari car, together with the first artist's impression of the Ferrari Theme Park on Yas Island. The capsule will be then opened again at Ferrari's 100th anniversary, in 2047. "This is a very special year for Ferrari" – Mr. Montezemolo said. "Together with the extraordinary commercial success of our GT cars, it brought to Maranello the F1 Constructors' World Championship and the F1 Drivers' World Championship with Kimi Raikkonen, and I am particularly proud to be present to mark the symbolic start of this great project. Moreover, 2007 is the year of Ferrari's 60th anniversary, and this Ceremony has therefore a further, important meaning." Part of a joint project between Italian automotive manufacturer Ferrari and ALDAR properties PJSC, the 250,000 sqm park (80,000 of them covered) will be a unique oasis of discovery, hospitality and beauty that captures culture, flavour and the true spirit of Italian country, as well as the legendary automotive history, feeling and heritage of Ferrari cars and racing. "Today is a celebration of the first step along the way to making the world's first Ferrari theme park a reality, with the laying of the foundation stone," – commented Ahmed Ali Al Sayegh, Chairman, ALDAR Properties. "An incredible amount of real estate growth is taking place in Abu Dhabi, and it is our responsibility to deliver projects of the highest quality, while protecting the natural, social and cultural assets of the Emirate. I am confident that the blend between the power and beauty of one of the world's leading brands, Ferrari with ALDAR's expertise in development and regional knowledge, will combine to create a destination that resonates with sports lovers around the world." When completed in 2009, the attraction will provide amusement for the whole family, featuring multi-format high tech theatres, a variety of sophisticated driving schools (for both children and adults), Ferrari automotive displays and participatory learning centres as well as food and entertainment. Among the 24 attractions, the Park will offer a mix of high-octane and family rides with roller coasters jetting into the sky and dipping through the covered areas. At the heart of the park will be an advanced and sophisticated circuit offering driving courses, which will be the home of the first Abu Dhabi F1 Grand Prix in 2009. After the Foundation Stone event at Yas Island, a brand new Ferrari Store will have its official grand opening in Abu Dhabi's Marina Mall. 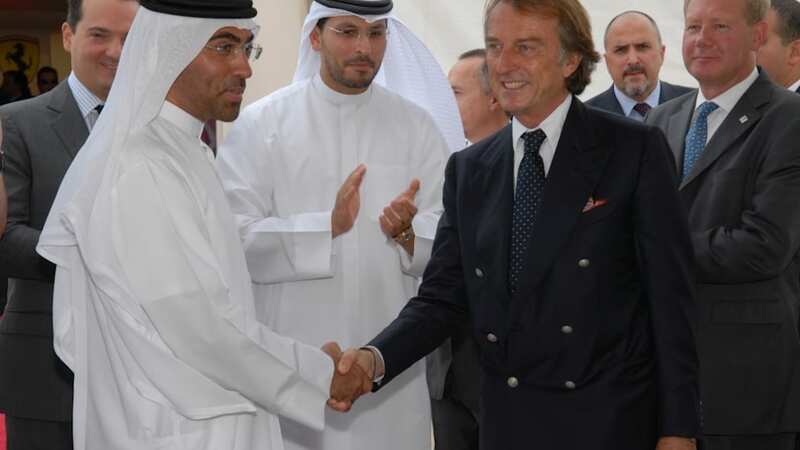 Ferrari's President Luca di Montezemolo, Commercial and Brand Director Dany Bahar, Abdullah Abdel Rahim Al Fahim, Chairman of Al Fahim Enterprises and Ahmed Al Sayegh, Chairman of ALDAR Properties will take part in the ribbon-cutting ceremony. U.A.E. (which includes Abu Dhabi, Dubai and other five Emirates) is one of the nine countries covered by Ferrari's Middle East & Africa Region. Ferrari entered the U.A.E. in 1987 appointing as exclusive importer and distributor Al Tayer Motors LLC, a parent company of Al Tayer Group. In 2006, the Region counted 248 cars delivered, for a 125% increase over 2004 and 84% increase over 2005. In 2006 Al Tayer Motors in U.A.E achieved 68 Ferrari retail sales. One of the biggest Ferrari Sales and After Sales Centre worldwide opened this September in Umm Al Naar - Abu Dhabi: 1,700 smq comprising a 870 smq showroom, lounge, dealer selection area, aftersales, spare parts and mezzanine floor for pre-owned car sales. Another Ferrari showroom in the U.A.E. is the 3S Centre in Dubai, Sheikh Zayed Road (opened in 2005). After the successful start of « Ferrari 60 Relay » worldwide tour in Abu Dhabi last January 28th and the Foundation Stone event at the Ferrari Park, which took place this morning in Yas Island, further major events in the area include the grand opening of two new showrooms: in Muscat - Sultanate of Oman (December 9th) and in Beirut – Lebanon (December 14th). On both occasions there will be the unveil of the new Ferrari 430 Scuderia to press and customers. ALDAR Properties PJSC is a leading property development company, with strong investment and management capabilities. ALDAR was established primarily to create world-class real estate developments for the nation of Abu Dhabi, whilst providing a stable and profitable investment portfolio for all our investors. We are dedicated to achieving new standards of innovation, excellence and value in urban design and sustainable development. Our priority is the immediate and future benefit of Abu Dhabi and its residents. The company is owned by leading Abu Dhabi institutions, founder shareholders and over 20,616 investors throughout the U.A.E. ALDAR's principle corporate shareholders include: Mubadala Development Company, Abu Dhabi Investment Company, Abu Dhabi National Hotels Company, National Corporation for Tourism & Hotels and National Investor.